September 15 is the 258th day of the year(259th in leap years) in the Gregorian calendar.There are 107 days remaining until the end of the year. 1440 – Gilles de Rais, one of the earliest known serial killers, is taken into custody upon an accusation brought against him by Jean de Malestroit, Bishop of Nantes. 1530 –Appearance of the miraculous portrait of Saint Dominic in Soriano in Soriano Calabro, Calabria, Italy; commemorated as a feast day by the Roman Catholic Church 1644-1912. 1616 – Joseph Calasanz opens the first modern public elementary school. 1794 – French Revolutionary Wars: Arthur Wellesley (later Duke of Wellington) sees his first combat at the Battle of Boxtel during the Flanders Campaign. 1795 – Britain seizes the Dutch Cape Colony in southern Africa to prevent its use by the Batavian Republic. 1821 – The Captaincy General of Guatemala declares independence from Spain. 1830 – The Liverpool to Manchester railway line opens; British MP William Huskisson becomes the first widely reported railway passenger fatality when he is struck and killed by the locomotive Rocket . 1851 – Saint Joseph's University is founded in Philadelphia. 1918 – World War I: Allied troops break through the Bulgarian defenses on the Macedonian Front. 1942 – World War II: U.S. Navy aircraft carrier USS Wasp is sunk by Japanese torpedoes at Guadalcanal. 1945 – A hurricane strikes southern Florida and the Bahamas, destroying 366 airplanes and 25 blimps at Naval Air Station Richmond. 1948 – The Indian Army captures the towns of Jalna, Latur, Mominabad, Surriapet and Narkatpalli as part of Operation Polo. 1963 – Baptist Church bombing: Four children killed in the bombing of an African-American church in Birmingham, Alabama, United States. 1967 – U.S. President Lyndon B. Johnson, responding to a sniper attack at the University of Texas at Austin, writes a letter to Congress urging the enactment of gun control legislation. 1971 – The first Greenpeace ship sets sail to protest against nuclear testing on Amchitka Island. 2000 – The Summer Olympics officially known as the games of the XXVII Olympiad were opened in Sydney, Australia. 2001 – President George W. Bush gives his first post September 11th weekly address. 2017 – The Cassini–Huygens probe is retired. Year 668 (DCLXVIII) was a leap year starting on Saturday of the Julian calendar. The denomination 668 for this year has been used since the early medieval period, when the Anno Domini calendar era became the prevalent method in Europe for naming years. Constans II, also called Constantine the Bearded, was emperor of the Byzantine Empire from 641 to 668. He was the last emperor to serve as consul, in 642. Constans is a nickname given to the Emperor, who had been baptized Herakleios and reigned officially as Constantine. The nickname established itself in Byzantine texts and has become standard in modern historiography. Year 601 (DCI) was a common year starting on Sunday of the Julian calendar. The denomination 601 for this year has been used since the early medieval period, when the Anno Domini calendar era became the prevalent method in Europe for naming years. 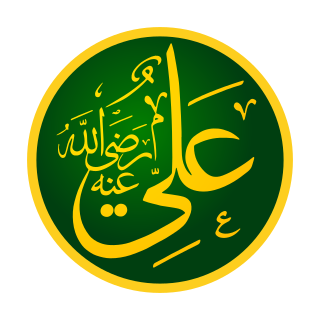 Ali was the cousin and son-in-law of Muhammad, the last prophet of Islam. He ruled as the fourth caliph from 656 to 661, but is regarded as the rightful immediate successor to Muhammad as an Imam by Shia Muslims. 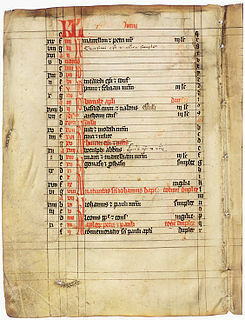 Year 767 (DCCLXVII) was a common year starting on Thursday of the Julian calendar. The denomination 767 for this year has been used since the early medieval period, when the Anno Domini calendar era became the prevalent method in Europe for naming years. Saint Ludmila is a Czech saint and martyr venerated by the Orthodox and the Roman Catholics. She was born in Mělník as the daughter of the Sorbian prince Slavibor. Saint Ludmila was the grandmother of Saint Wenceslaus, who is widely referred to as Good King Wenceslaus. Year 1140 (MCXL) was a leap year starting on Monday of the Julian calendar. Albin or Alpin is the 14th bishop of Lyon who succeeded Saint Just. He is recognized as a Saint by both the Roman Catholic Church. and the Orthodox Church and is celebrated on 15 September. Saint Aprus was the seventh bishop of Toul. He has been considered a saint in Toul since the 10th century. His feast day is celebrated on 15 September. Saint Catherine of Genoa was an Italian Roman Catholic saint and mystic, admired for her work among the sick and the poor and remembered because of various writings describing both these actions and her mystical experiences. She was a member of the noble Fieschi family, and spent most of her life and her means serving the sick, especially during the plague which ravaged Genoa in 1497 and 1501. She died in that city in 1510. Cry of Dolores , celebrated on the eve of Independence Day (Mexico). Independence Day, celebrates the independence from Spain in 1821 of Guatemala (a Patriotic Day), El Salvador, Honduras, Nicaragua, and Costa Rica. Abibo Joseph is the name of a saint from Alaverdi. He is mentioned in Bessarion's The Saints of Georgia. His feast day is celebrated on September 15. ↑ "Diversity - UMUC". www.umuc.edu. Wikimedia Commons has media related to September 15 .